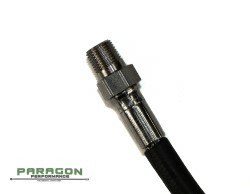 Paragon Performance's PTFE stainless steel braided Paintball C02 hose provides superior fluid handling at high pressures. We offer hoses with a choice of Stainless Steel braid or stainless steel braid with a protective jacket. The jacket will make the hose easy to clean and keep it from scratching your gun; colors include Clear, Smoke or Jet Black. 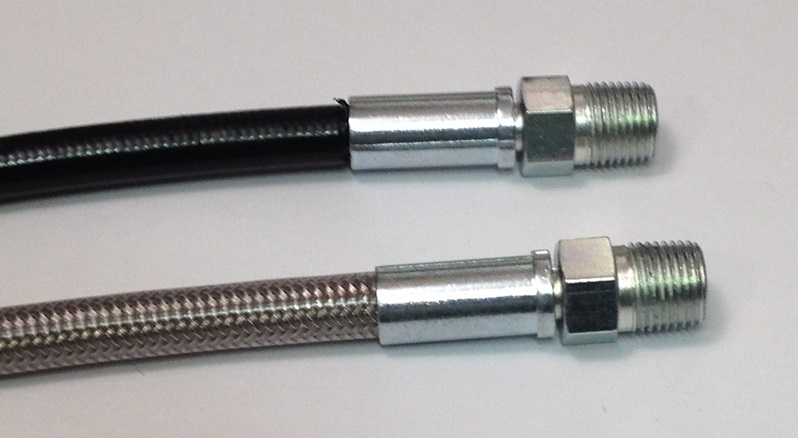 All of our PTFE hoses are made to order, so custom lengths are no problem! Our operating pressure of 3,000 PSI and 12,000 PSI burst makes your High Pressure CO2 applications a no brainer. Our prices are VERY competitive! But you already knew that! 1/8" Male NPT by 1/8" MNPT, 15 inches OAL. Brass Fittings, Paintball Hose Assembly rated 3,000 PSI.